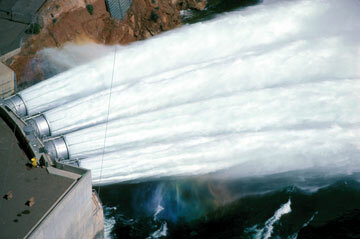 Water spews from Glen Canyon Dam after fulfilling its hydroelectric function. As this story went to press, California was burning up, both literally and figuratively. Much of the state was burning in wildfires and hot temperatures were exacerbating the situation. Together, this situation is overtaxing the already-tight electric grid, with officials asking consumers to conserve power and curtail electricity use during peak demand hours. This isn’t a situation that is likely to improve in the future. Instead, this is just one example of how a warming climate could affect electricity. 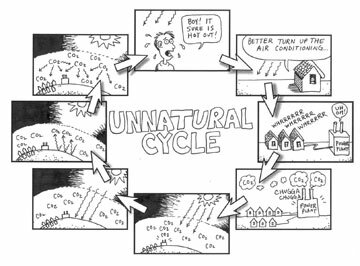 Whether the global temperature increases of the past few decades are part of a natural cycle, due to anthropogenic emissions or some combination of both, it is clear that Earth and its atmosphere are constantly changing. Projections of future climate change vary substantially, both globally and regionally. And as in the past, humankind will respond to climatic and environmental changes by adapting existing systems and by creating entirely new ones. These existing systems include one of the largest and most complex systems ever created: the electric power grid. The power grid consists of electricity-generating power plants connected by a network of wires — both high voltage transmission lines and lower voltage distribution systems — that transports electricity from generating sources to our homes, schools, factories and other places of business. Climate affects all major aspects of the electric power sector, from electricity generation, transmission and distribution systems to consumer demand for power: If temperatures increase, people turn up their air conditioning and electricity usage spikes. If there’s less rain, there’s less water for hydropower. In myriad ways, electricity and climate are highly interconnected. Because climate models predict that the effects of climate change will vary by region, it is likely that future impacts on the electric grid will vary by region too. Take the American West, for example. If extreme predictions of warmer temperatures and lower precipitation come to fruition in the western United States, they would significantly impact the western power grid, by overtaxing it and causing probable electricity shortages unless we build a lot of extra capacity. Such climate changes would likely have a similar effect around the world. 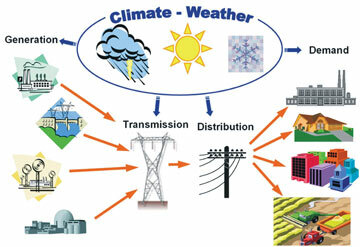 Climatic impacts on the electrical system. My colleagues at Argonne National Laboratory and I recently studied how climate change might affect the electric grid. Three large, interconnected grids power the mainland United States: The Western Electricity Coordinating Council (WECC) encompasses all or parts of 14 western states as well as parts of southern Canada and northern Mexico; the Electric Reliability Council of Texas covers most of Texas; and the rest of the United States is part of the Eastern Interconnect. Our team specifically analyzed the potential impacts of climate change in the U.S. WECC region. Through the course of our study, one thing became abundantly clear: Our electrical grid — especially in the West — will be stressed if the climate changes as scientists predict. Weather and climate affect all types of electrical production — everything from traditional coal-fired power plants to those that run off renewable energies such as hydroelectric power or wind — but not in the same way. Thermal plants — which use heat from burning fossil fuels and biomass, geothermal or nuclear energy sources to produce energy — account for about two-thirds of power generated in WECC. At thermal power plants, electricity generation becomes less efficient as the ambient air temperature increases. As a result, more fuel is consumed to produce the same amount of electricity, raising power plant emissions. This is most pronounced with technologies that use gas turbines, accounting for about 8 percent of the generating capacity in WECC. The amount of electricity a plant can produce also decreases when temperatures rise, which ultimately may require constructing more generating units. Furthermore, changing temperatures and humidity levels alter the effectiveness of power plant cooling systems, which are utilized by technologies that use steam as a primary mover; in this way, higher temperatures and more humid air, for example, can decrease the electricity-generation capacity of a plant. Weather and climate also affect renewable power technologies — especially hydropower, the primary renewable energy in the West (see sidebar). 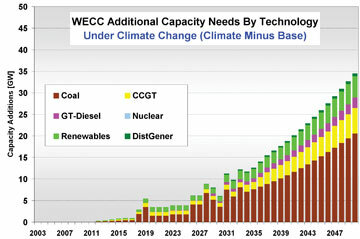 Currently, renewable technologies produce about one-third of the electricity in WECC. The vast majority, about 85 percent, comes from hydropower plants that rely on water released from reservoirs or uncontrolled stream flows as an energy source. Factors such as precipitation, snowpack levels and the timing of snowmelt affect hydropower production. Moreover, humidity levels and wind speed impact water loss in reservoirs due to evaporation. The seasonal timing of precipitation and weather events significantly influences hydropower economics and the operation of the entire power system. Electricity generated from hydropower plants has the highest value when the demand for power is the greatest. In most of the West, this typically occurs during the warmest summer months. But a warmer climate might mean earlier snowmelt, which could reduce the value of hydropower resources. Some of the negative impacts of early snowmelt can be mitigated through reservoir management, but there is a limit to the amount of water that can be stored. And hydropower plants that rely on river flows instead of reservoirs cannot store any water, so generation is dictated entirely by streamflow rates. 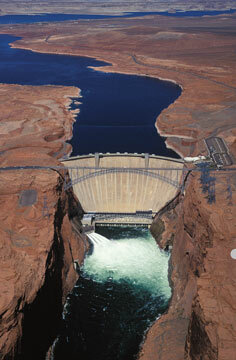 Glen Canyon Dam is one of the largest concrete dams in the world. Other renewable technologies are also affected by weather and climate. Solar technologies, for example, are affected by cloud cover and the amount of solar radiation that reaches the ground. Wind power production can change drastically if wind conditions change. If the wind is too slow, power generation ceases. If the wind is too fast, wind turbines must be turned off to protect the equipment from mechanical and electrical stress. No one can predict what wind changes might occur with climate change, but it is important to note that any changes do affect the system. 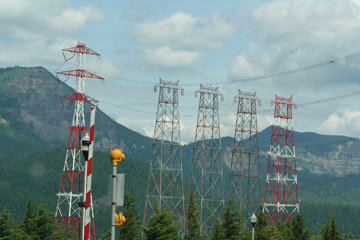 Electricity generation is not the only facet of the electric grid system that is affected. Higher air temperatures exacerbate thermal expansion of power transmission and distribution lines, which cause lines to sag: Go outside on a hot summer day and you’ll notice that the electrical lines sag more than they do on a cooler day. That line sagging decreases the amount of power that can be securely transported. Other factors, such as wind speed and direction, also affect transmission line cooling. Under high load periods, the reduced capability of transmission lines increases congestion problems in some regions, potentially causing everything from utilizing units that have high operating costs more frequently to higher incidences of rolling blackouts. On the demand side, a changing climate both negatively and positively affects consumer needs. Higher summer temperatures in warmer regions of the western United States, such as Arizona, California and New Mexico, increase the use of air conditioners, leading to higher energy consumption. On the other hand, warmer winter temperatures in colder regions, such as Colorado, Montana, Idaho and Washington, reduce the demand for powering heaters in the winter. Other weather factors, such as wind speed, humidity levels and cloud cover, also affect heating and cooling requirements, which, in turn, impact power consumption. A drier and warmer climate also increases the loads on electric pumps in irrigation systems. To consider the future impacts of climate on the electric grid in the American West, we analyzed four climate scenarios for the period 2003 to 2050 — a reference scenario in which climate stays the same and three warmer scenarios with varying degrees of precipitation levels ranging from a drier climate to a wetter one. For all three climate change scenarios, we assume the same rate of global warming which is based on projections from the U.S. Climate Change Science Program (CCSP). To meet all electricity needs in WECC by the year 2050 under the reference scenario, we will need to build about 235 gigawatts of additional capacity. That’s a lot — almost twice as much capacity as currently exists in WECC today. The West is aiming to meet that growing demand through constructing new plants. However, under different climate scenarios, electrical demand increases a lot more. In fact, in all other scenarios, the planned level of new construction will not be anywhere near sufficient to keep up with demand. Under the most extreme warming scenario that CCSP predicts, average temperatures across the WECC region gradually increase to 5.2 degrees Celsius above the reference scenario temperatures by 2050. Such warming would result in demand for 9 percent more electricity above and beyond the reference case. Under this scenario, the highest demand for electricity (late afternoon or evening on a very hot day) would be about 342 gigawatts, or about 30 gigawatts higher than the reference case. To reliably meet this higher demand, 35 gigawatts of additional capacity above the reference case would need to be constructed. That’s equivalent to 70 new 500-megawatt coal-fired generating units, or on average about 1.75 large additional units each year between 2010 and 2050 above and beyond what is needed under the reference scenario. In the reference scenario and the aforementioned scenario with higher temperatures, we assumed that hydrological conditions — the amount of water in streams, lakes and the snowpack — were constant. But because a third of the electricity in WECC comes from hydropower (and two-thirds in Washington, Oregon and Idaho), and hydropower is dependent on hydrological conditions, we also ran two climate change scenarios to examine the effects of potential changes in hydrological conditions due to climate change. The first scenario assumes both warmer temperatures and drier hydrological conditions. This scenario results in a 10 percent decrease in hydropower electricity production relative to the reference case. The second hydrological scenario, warmer temperatures and wetter hydrological conditions, assumes a 6 percent increase in hydropower production. Hydropower assumptions are based on a study of the Central Valley Project in California, conducted by the California Department of Water Resources in 2006. The scenarios show that changes in hydrological conditions could affect the grid positively or negatively, depending on what happens. Several studies, however, indicate that the West will become drier and snowpack will be less, which will have a negative effect. But what’s it all cost? In our scenarios, we projected that most of the additional capacity would come from coal as the primary energy source, followed by natural gas. These two energy sources are the most abundant and cheapest fuels in WECC. Generation technologies that rely on renewable energy sources, such as wind and solar, will also be used to meet the increased demand for electricity, though at lesser amounts. Our team investigated the costs of future climatic impacts on the electric grid, but costs will obviously vary depending on the type of fuel, how far it has to travel, if a different type of electricity generator needs to be installed, how much additional capacity needs to be built and more. 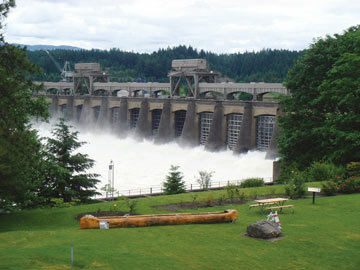 The Bonneville Dam spans the Columbia River between Washington and Oregon, about 65 kilometers east of Portland. The two powerhouses at the dam can produce 1,084 megawatts of electricity. Overall, a warmer climate in combination with drier conditions will increase the cost of fuel and variable operating and maintenance costs above the reference case by about $61 billion from 2003 through 2050. This change is mainly attributed to higher utilization rates of relatively expensive sources of energy that are already peaking, such as natural gas. However, if the climate becomes wetter than the current one, but still warmer, production cost increases are expected to be less, only about $25 billion above the reference case. The capital investment cost to build the additional capacity above the reference scenario will be about $8.9 billion (in 2005 dollars). Additional fuel and variable operating and maintenance costs over the analysis period would be about $36 billion — or almost 5 percent higher than the reference case. Of course, future expansion decisions will depend on everything from change in capital costs to fuel costs and climate policies. Thus, the actual technology choices and costs are highly uncertain. The only thing certain about the costs, in fact, is that they will be higher in a hotter, drier climate. Our study examined everything from changes in investment requirements to fuel and generation mix and greenhouse gas emissions to the amount of water that thermal power plants use to make the steam that turns turbines for electricity production. But many other factors that we did not include in this preliminary study should be included in future studies of this sort. For example, in addition to costs, both freshwater consumption by U.S. WECC thermal-electric power plants and carbon dioxide emissions are expected to be about 10 percent higher than in the reference case. The impact of these higher carbon dioxide emissions on the climate should be analyzed, as that may change these scenarios further. This fact underscores the importance of looking at the climate change problem from many different angles. It is obviously important to incorporate the reaction of humankind to climate change into the climate change equation. These reactions may either help mitigate the problem or exacerbate it. Another aspect of climate change that may increase the cost of power production is the increased pressure on fuel prices. As the demand for electricity swells above the reference scenario, consumption of fossil fuels at power plants will also increase. The price of natural gas is particularly sensitive to supply and demand balances. And then there’s the issue of increased prices for fresh­water and the potential for disruptions in power supply due to potential shortages in power plant cooling water, which we also did not consider in this analysis. This was a preliminary investigation of one of the more extreme climate change forecasts. Although we considered many aspects of the problem, many more refinements to the analysis could be undertaken in the future. For example, analyses could be done on a more refined geographic scale, including a detailed treatment of the transmission system. In its fourth assessment report last year, the Intergovernmental Panel on Climate Change included an entire section on the economic impacts of climate change. The panel specifically identified water and energy issues as growing concerns around the world, in both developing and developed nations. Studies like this help us to realize that a warming climate won’t simply affect our air temperatures. Warming will also affect our pocketbooks. 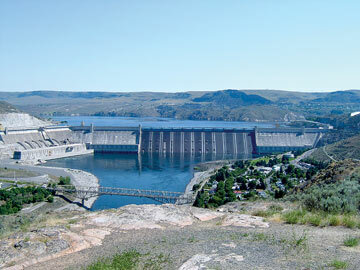 The Grand Coulee Dam in Washington is one of more than a dozen large hydroelectric dams on the Columbia River. At more than a kilometer long, it is the largest hydroelectric facility in North America and the largest concrete structure ever built. Its three power plants can produce 6,809 megawatts of electricity. In the Western Electricity Coordinating Council (WECC), which encompasses all or parts of 14 western states as well as parts of Canada and Mexico, a third of the electricity comes from hydropower. Dependent primarily on annual precipitation levels, hydropower plants serve from 25 to 40 percent of U.S. WECC electricity demand. And in Idaho, Washington and Oregon, two-thirds of electricity comes from hydropower. However, those numbers are changing. From the mid-1960s through the 1980s, hydropower production fulfilled more than half of the demand for electricity in the WECC region in wet years, with a lower amount served in drier years. (Hydropower production depends entirely on hydrologic conditions — the amount, timing and location of rainfall and snowfall.) In the mid-1980s, however, the percentage of power provided by hydropower began decreasing as the rate of new hydropower plant construction and upgrades slowed despite increases in power demand. Thus, in more recent years, due to both this decrease and drier hydrological conditions, hydropower has fulfilled only about one-fourth of the electricity load throughout WECC. Furthermore, despite calls for more renewable energy, due to cultural and environmental concerns in this region — such as concerns over fish — new construction of hydropower capacity is expected to be almost negligible. Hence the percentage of the load served by hydropower is expected to further decline to less than 15 percent by 2050. Essentially, load growth will no longer be served by hydropower, but by other technologies — mainly fueled by other renewable technologies and fossil energies. Indeed, new wind and to a lesser extent solar technologies are expected to grow at a rapid pace. This growth is partly driven by technological improvements and partly by state legislation that mandates targets for generating a minimum amount of electricity from renewables. The majority of WECC’s additional electricity will come from coal, with natural gas and renewables making up most of the rest. Hydropower’s future role in generating electricity in Idaho, Washington and Oregon is also uncertain. Forty percent of all U.S. hydropower comes from two rivers that flow through these states: the Snake and Columbia rivers. The supply of water is continually replenished through rain and snowmelt from the mountains. However, as the climate changes, so too does precipitation. In high altitudes, such as the Cascade Range, much of the precipitation falls in the winter as snow, where cold temperatures trap it in a snowpack. Then, when temperatures warm in the spring, the snowpack melts, and water slowly drains from the mountains and can be captured in reservoirs. In mountainous regions that hover around the freezing point, small temperature increases can cause the precipitation to fall as rain rather than snow, significantly reducing the snowpack and thus making less water available later in the year because the rainwater immediately drains out to sea. Furthermore, such changes can lead to streamflow peaking earlier than usual and either causing flooding, or again, draining out to sea. Most reservoirs are not built to handle excessive water inflows as a result of rapid spring snowmelt or large storm systems, and they cannot be expanded. Trouble may thus be on the horizon. Veselka is an energy systems engineer at Argonne National Laboratory in Illinois. He has worked on numerous energy and environmental issues for more than 27 years, including the Clean Air Act, acid rain legislation, restructuring open power markets, utility system capacity expansion, the energy-water nexus and optimal power operations. Some of his sponsors over the years include the U.S. Department of Energy, World Bank, International Atomic Energy Agency, Energy Information Administration, Bureau of Reclamation and the Western Area Power Administration. Veselka thanks the Argonne staff — Audun Botterud, Guenter Conzelmann, Vladimir Koritarov, Les Poch and Jianhui Wang — who helped with the analysis and significantly contributed to the article.